Over two weeks late (September and early October both Quentin Norton, Board Chair and Mara Richards, CEO of Robinvale District Health Services, were privileged to participate in a whirlwind tour of some of the best health services in the USA and Canada, hosted by the Victorian Healthcare Association (VHA). The places visited were; Boston, Toronto, Thunder Bay, Salt Lake City and San Francisco. Quentin represented the health service at its governance / decision making level, as the Board is keen to continue its innovative approach to developing its health services and this requires an investment in RDHS leadership, hence the sponsorship of Quentin’s attendance. Mara was fortunate to have been successful in obtaining a full scholarship, one of three available Victoria wide and the only one available for the rural area. 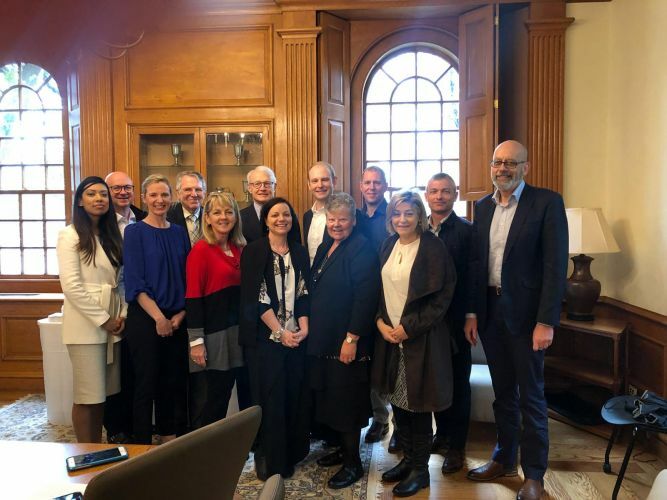 The opportunity to meet with people of high calibre and great knowledge within the health and medical profession, recognised worldwide for their leadership of leading and innovative health services has been very valuable. Strong connections have been made and Mara has already received her second email from a colleague managing a health service similar to RDHS literally 400 kms from nowhere in the middle of the Canadian wilderness, nearby Thunder Bay on Lake Superior. Both Quentin and Mara received several warnings not to walk around the town due to its “bear” problem! Needless to say we were both “disappointed’ not to have seen one? We look forward to developing a relationship with this health service because of its similarities to our own. Surprisingly the health issues are eerily similar to what we experience in Australia and indeed Robinvale is no stranger to the health concerns discussed. Of great interest to both Quentin and Mara was the visit to a community health centre located on the outskirts of Toronto, Canada, specifically for the “First Nations” people called “Anishnawbe”. We both felt comfortable and “right” to be there and were made to feel very welcome. After the initial welcome, once we started yarning, it became very apparent to our hosts that we were a group that “got it” (that is understood the issues surrounding and affecting our Aboriginal community). Our conversation then changed to be very relaxed and we all felt very respected towards each other. Our host commented to Mara, had he “known” what type of visitors we were he would have organised a smoke healing session in their Tee pee in the back yard. We felt very honoured just with the comment. There was also the “amazing” we observed during our visit including a robot that dispensed medications and a company that cultured human cells to cure disease. Not all diseases at this time however starting with Leukaemia and blood based cancers!. We also spoke at length with several organisations that simply do innovation and best clinical practice in all settings to ensure the advancement of patient safety in the care they receive. Focus on the patient and not the health service or its providers. The Study Tour was hectic and fitness was an essential requirement to keep up with the gruelling schedule and itinerary. However, for all the walking, talking and meeting, both Quentin and Mara got to see and experience another world of health services and systems and gained a new appreciation of investing in innovation from both our staff and our community. We serve you all and we would encourage very strongly your input and thoughts about what you need from RDHS. Quentin invites you all to have your say and share your thoughts, whatever they may be. Join up to the Community Advisory Committee or simply drop in and ask to speak with Mara to enable us to think “outside the square” on our current and future services. On a personal note we were both very homesick towards the end and Robinvale is like no other town or city we visited. Our health service is in reality comparable on the world stage and we are both confident that we will only grow stronger and more relevant to our community with your input and feedback!